U.S. Rep. Ilhan Omar (L) and Rep. Rashida Tlaib listen as U.S. President Donald Trump delivers his State of the Union Address to a joint session of Congress on Capitol Hill, Washington, Feb. 5, 2019. 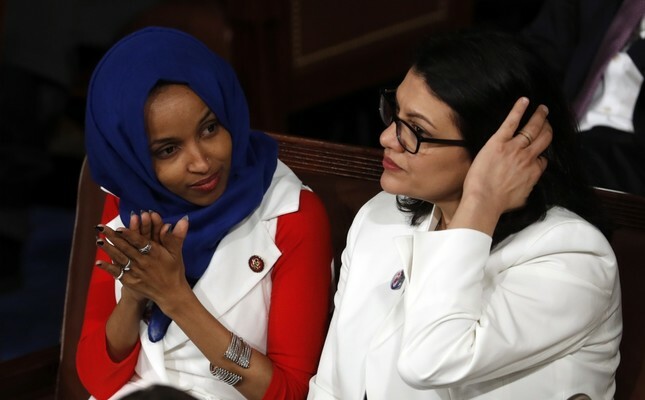 People around the world witnessed a historical moment, when for the first time in ever in the United States of America, two Muslim women entered Congress. In an age of Islamophobia as a widespread acceptable form of racism, this was of symbolic nature. Two Muslim women, not men, not only contradicted the image of the oppressed Muslim woman, but also showed their constituency that they are humans working for the progress of their societies. This is especially important given the many experiences of Muslim politicians that are excluded from the political realm. One of the most prominent examples from Europe is the case of the Swedish Green Party. In 2016, a trusted member of parliament for eight years, who in 2014 had become the first Muslim minister in Swedish history, was ousted alongside numerous other party members for allegedly being "infiltrated" by the Muslim Brotherhood. While these allegations had been trumped up in 2016 McCarthy style and were unsubstantiated, still the media attention had created so much pressure on the Green Party that they submitted themselves. Other politicians with a Muslim background have gone through similar experiences, albeit on a less prominent level and are thus less known. Recently, a national deputy from the German Christian Democratic Union (CDU), Veronika Bellmann, argued that there was no place for Muslims in her political party, which, in fact, includes prominent figures with Muslim background even in higher positions than Bellman's. She represents the right-wing faction within her conservative party and is a member of the Berliner Kreis, a circle of mostly right-wing people within the Christian Democratic Union that confirms the narrative of a Judeo-Christian cultural heritage in Germany. While arguing that the circle is against anti-Semitism and Islamophobia, they defend the ban of the hijab for public servants and argue that the end goal of a successful integration policy must be assimilation. According to Bellmann there was no space for Muslims in the CDU at all. According to her, Muslims "today present themselves secular and tomorrow they present themselves strictly religious". These attempts to exclude Muslims from the political realm by referring to their Muslim identity has been there in Europe for a while and seems now to also come to the United States. In fact, the allegations of Muslim politicians being a threat remind us of similar strategies in the U.S., starting from calling Barack Obama a supporter of the Muslim Brotherhood to allegations that Rashida Tlaib would be a danger and blow up the U.S. Capitol. Tlaib, one of the two new congresswomen, was called "a Hamas loving anti-Semite" in a petition for her resignation, whereas she replied in a tweet that "this sort of hateful anti-Muslim rhetoric doesn't happen in a vacuum – this president embraced it and Republicans have happily gone along with it." Some journalists observed an attempt by some Middle Eastern countries to disseminate the allegations of both congresswomen to being secret members of the Muslim Brotherhood and some conservative pastors like E.W. Jackson are taking this up to complain that Muslims are taking over Congress. Jackson said: "The floor of Congress is now going to look like an Islamic republic" and similar to European radical right discourse argued that, "we are a Judeo-Christian country. We are a nation rooted and grounded in Christianity and that's that," thus excluding the Muslims from governmental representation. But it is not only Republicans who deploy Islamophobic conspiracy theories against members of their opposing political party. A recent case that has been widely covered within the last months was Shahid Shafi, a Republican trauma surgeon. Shafi, who had won the Southlake City Council seat on his second try in 2014, has served as a delegate to multiple Texas GOP conventions. When Shafi became vice chairman of the Tarrant County Republican Party in North Texas, it took only a couple of days before a precinct chairwoman urged the chairman of the Tarrant County Republican Party to "reconsider" appointing Shafi to a leadership role. The chairman had revealed that "the only reason she had was because he was a Muslim." The precinct chairwoman even filed a formal motion to remove Shafi as vice chairman because of his religion. The accusations said that Shafi was a "fake Republican," who might have only become one at the urging of the Muslim Brotherhood so that he could infiltrate the party. The attempt failed with 49 votes to oust Shafi – who was backed by Ted Cruz – from his post versus 139 that supported him. Nevertheless, it tells us about the widespread Muslim Brotherhood-conspiracy as a useful means to simply reject people based on their religious affiliation. It is under the increasing pressure from radical right political parties in Western Europe and the rise of Islamophobic populism under Donald Trump that these allegations are becoming more and more mainstream. Muslims are excluded from the domestic political game next to the radical right trying to refuse them admission into the Western heartland, as manifested in the Trump administration's Muslim ban or the "fortress of Europe." If we want Western societies to stand for human dignity, equality and freedom of religion, then these tendencies have to be fought. * Political scientist and senior research scholar at Georgetown University's The Bridge Initiative at the School of Foreign Service.